The sidebar provides you with a comprehensive list of tools that allow us to perform functions in the admin system. Each set of tools is grouped into what we call "widgets". Hint: Widgets like Posts, Media, Links and Pages has a drop down arrow in the top-right corner, which allows you to expand or collapse the widget. 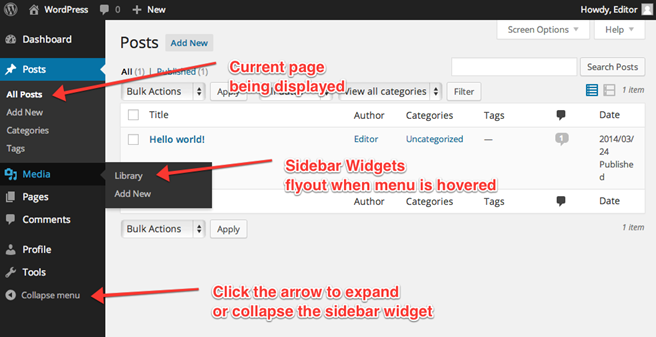 You can also expand or collapse the entire sidebar by clicking on the Collapse Menu, which appears as the last link on the sidebar. This is useful for saving space on your screen. Each of these tools will be explained in more detail later on.